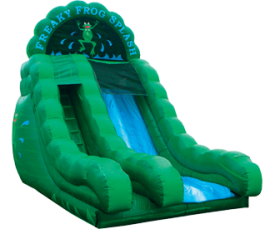 Great for all ages, with its beautiful green marble material and freaky frog theme this slide is guaranteed to bring all the fun. Its landing can be used wet or dry. This slide is designed for those, who don’t want to deal with a pool filled with water. A 15’ detachable landing mattress is included and attaches in minutes. Kids will be talking about this way after the event is over.